To capture the details of a wedding, “headless” photos are essential in wedding photography. When taking wedding portraits, you may immediately think about capturing the expressions on the faces of the bride and groom. After all, they are the main focal points of the day, and the looks on their faces reflect the love they feel for one another, the love that makes the day so special, and the love that makes the wedding happen to begin with. But what about the other parts of the wedding? The details? When it comes to wedding photography, many people don’t, typically, think of snapping photos without heads of the bride and groom or members of the wedding party. “Headless” wedding photographs, however, allow for focus on the details of the wedding. Some details that promote headless portraits include flowers, the bride’s wedding dress, the groom’s wedding garb, and their shoes. Let’s take a look at a few headless wedding photographs that allow for focus on the bride’s flowers. 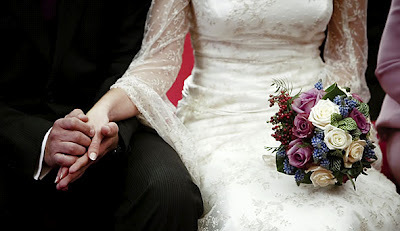 Although some brides choose to plan their wedding without bouquet, a bridal bouquet almost always present at a wedding. A bride puts in a significant amount of time and money to choose the right bouquet and flowers for the wedding. Some traditions says that bouquets of strong-smelling herbs and flowers were carried by the bride to ward off evil spirits on her wedding day. Others say the bride’s bouquet is a symbol of fertility and representative of the children she will bear. With all of the thought and consideration placed on choosing the right flowers, there should be some focus given to the bridal bouquet in wedding photos. Selecting the perfect flowers can be challenging at times. Today, brides choose flowers that grow in a certain color, flowers that grow in the appropriate season, flowers that match the style of the wedding, and flowers that compliment the bride’s personality. Many brides have their bridesmaids carry flowers as well. If this is the case, it’s possible to capture a photograph of a single bridesmaid carrying her bouquet. With a headless shot, the lone bridesmaid can represent them all. Of course it’s possible to capture all of the bridesmaids’ bouquets at one time. There’s something very beautiful about photographing the bridesmaids’ bouquets as they stand in their natural positions during the wedding ceremony. Some brides choose to be photographed alongside all of the bridesmaids. By cropping off the top-half, the focus immediately goes to the bright and vibrant colors of the bouquets. Headless wedding photographs allow us to draw more attention to the details of the wedding. A bride’s bouquet is a detail she will want to remember. After all, it is the last thing she holds as a single woman, and the first thing she holds as a married woman (aside from her husband’s hand, of course).